So here we are on the last Sunday — and last day! — of 2017, and it’s time again for The Legal Genealogist to stop for a minute and take stock on the DNA side of genealogy. It’s the perfect time to stop, and think, and look back and ask myself: What am I doing right, what am I doing wrong, and what could I be doing better in 2018? Part of the problem, of course, is that things are changing so fast on the DNA front that it’s hard to even catch up, much less keep up, with developments: new tools, new testing companies, new ethical conundrums and more. But that doesn’t mean we don’t have to try our best. So — taking stock — I’ll give myself a basic pass on education, since I’ve taken two institute courses and listened to a whole raft of presentations and webinars on DNA in the last three years. In some ways, I think what that’s brought me is a deeper understanding of the complexities of DNA. Doesn’t mean I can’t do better, but at least I’m not losing ground there. I think. And I’ve done a pretty decent job, I think, of integrating DNA analysis into my research plans. Whenever I’m looking at a relationship question in my own research, I now automatically think about how DNA could be used to help develop the proofs — even if, in the final analysis, it isn’t useful or available in a particular case. So I’ll give myself a pass on research integration. I do need to do better in 2018, through blog posts and other research efforts, to distinguish between and among the testing companies. I really didn’t feel that I could do a new Bang-for-the-Buck post any time during 2017 because things were changing so fast. I’m hoping they’ve stabilized enough for now that I can at least give it a try early in the New Year. So I’ll give myself a “needs improvement” on researching the companies. And … sigh … no matter how far I might think I’ve come, I still have three big areas where I need to do better. These haven’t changed one bit from last year. 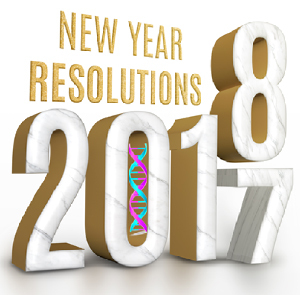 So… in the hopes that at least this genetic genealogist will do better in the year to come, here are my suggestions for three critical resolutions we can all make that would benefit us all as genetic genealogists. I get it. I really do. I understand only too well how much we all want DNA testing to be the magic bullet. Just take this test, click on that little icon2 and — presto! — all of our genealogical brick walls will come tumbling down. And it’d be fantasy, not reality. As much as I’d love to wave the magic DNA wand and get the answers to all my genealogical questions, the reality is that DNA testing is just one more type of evidence that has to be used in conjunction with — alongside — hand-in-hand with all the other types of evidence we collect along the paper trail. It’s something we use with our other tools, not instead of our other tools. I need — we all have to have — the documentary evidence to put DNA evidence into its proper place. Understand that what these estimates do is take the DNA of living people — us, the test takers — and they compare it to the DNA of other living people — people whose parents and grandparents and, sometimes, even great grandparents all come from one geographic area. Then they try to extrapolate backwards into time to estimate (or guess) what the population of, say, Ireland or Egypt looked like 500 or 1,000 years ago. Please… read up on the limits of ethnicity estimates.7 And then put that aside in favor of all the things DNA tests really can do for genealogy. Goes without saying, doesn’t it? How many of us bid a sad farewell to a loved one in 2017? How many of us will have to bid farewell to someone we love in 2018? How many of us ourselves will not be here to ring in the New Year of 2019? So the number one priority resolution for 2018 — as it was in every year before — has to be not to lose that genetic legacy. Let’s get our oldest generations tested. It’s pretty bad when I realize as I read this that I’ve almost *become* the oldest generation! Great resolutions. Thank you for, once again, wrapping up the year for us. That’s so true about getting our older relatives tested. It’s also a good opportunity when they do a DNA sample for us to interview them and get some facts and stories about our ancestors at the same time. Absolutely, Owain: talk to people!!! Get their stories. I am glad we got all three of our remaining Williams elders to test; now there are only two of them left, then it’s me. I wish I had gotten my dad (Thomas Marshall) to take the 23andme swab test before he passed in 2014 from severe dementia. I’ve only gotten my brother to take a Y-DNA test from dad’s line, and me, my brother and sister and one son to take autosomal tests to try to find connections for my dad’s family. It is certainly better than nothing, but I would love to persuade my Marshall cousins to take the test too.